KMPG has also advised the cash-strapped council to close 21 of the smaller libraries or hand them over to volunteers. This from an authority once lauded by the Libraries Taskforce as a flagship, innovative, library service for others to emulate. Although many authorities face difficult budget challenges some of the financial decisions made by the council appear ill-advised such as paying their ex-CEO, and ex-chair of the Taskforce, over £100k for simply retiring. It has also been revealed that the council re-engaged an ex-member of staff and paid them a £1,300-a-day consultancy fee, along with another member of staff who was given a £50,000 pay-off, and then the firm she owned was paid £650 per day to oversee an IT project. These instances are the ones that have been made public so it has to be wondered at how many other examples exist of what is at best poor oversight of council expenditure. Such payments will be a smack in the face to those library workers now facing job losses and redundancy and none will receive anything like the above rewards. Apparently staff morale among the library workers is, not surprisingly, at rock bottom. My thoughts are with all the library staff caught up in these horrible circumstances and the uncertain future they face. All of this is happening on the doorstep of Northamptonshire MP and Minister for libraries, Michael Ellis. Given the DCMS woefully inadequate response to other major library cuts nationally I have no reason to think that Mr Ellis will be any more likely to intervene than his predecessors. After, the root cause of all this distress can be directly laid at the feet of this government’s policies. Lastly, given the rushed nature of the proposals no consideration seems to have been given to any form of consultation or provision under the Equalities Act. It will be interesting to see how the Council justifies such a move. Nick Poole expressed Cilip’s solidarity with and support for all of the staff and library workers affected by the decision. He also urged CILIP members affected by the decision to make contact with the Member Services team for advice and support. 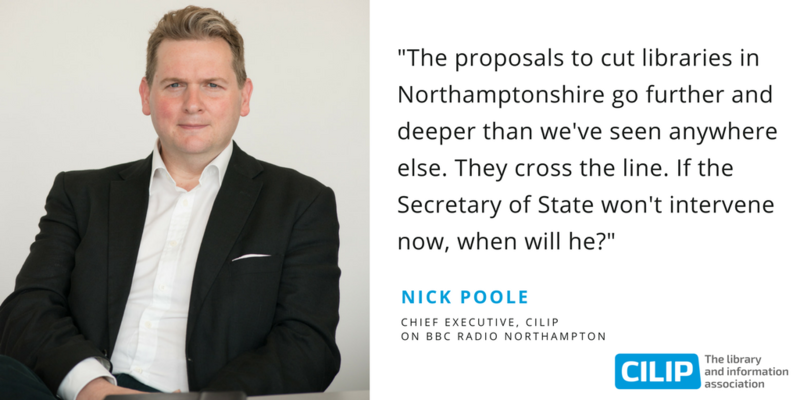 Nick has also appeared on BBC Radio Northants challenging the Libraries Minister to intervene. Previous Post: A Few Interesting Things! Well well who would have thought it!! The well paid head of the so called Task Force (wonder what all the Task Force time and pay has cost), who was the CEO of the County Council, then retired (early? ), with a bumper pay off, was supposed to be representing public libraries, then closes a whole lot of them. These are just the people we need., supporting public libraries?, concern for their rate payers?, stuffing their own pockets and stuff the public, whose rates etc pay their salaries.It is frankly outrageous, and that the DCMS are turning a blind eye!! I have no hope left for the future of public libraries.